"Sometimes you need to scorch everything to the ground, and start over. After the burning the soil is richer, and new things can grow. People are like that, too. They start over. They find a way." In Shaker Heights, everything seems to be planned and in order. Elena Richardson is a good representation of Shaker Heights, because her principle is to live according to the rules and plans that she has made. But then, her other house was rented by a woman named Mia Warren, an enigmatic photographer and a single mother, who's been constantly moving places every time she finishes a project. When they settled down in Shaker Heights, Mia's daughter, Pearl, found herself enjoying her time at the Richardsons' house together with the children. Unfortunately, the good relationship between these two families didn't seem to last long. "One had followed the rules, and one had not. But the problem with rules... was that they implied a right way and a wrong way to do things. When, in fact, most of the time they were simply ways, none of them quite wrong or quite right, and nothing to tell you for sure what side of the line you stood on." The tension between Mrs. Richardson and Mia began when a child custody battle erupts in Shaker Heights and they found themselves on opposing sides. On one side, there's the biological mother who's Mia's co-worker. On the other side is the McCulloughs, Mrs. Richardsons' friends who has tried to have children for so many years but always failed miserably. As time goes by, Mrs. Richardson tries to figure out what kind of person Mia exactly is and goes on a hunt for Mia's past. She didn't realize that her actions will bring disasters upon her family and also Mia's. "Most of the time, everyone deserves more than one chance. We all do things we regret now and then. You just have to carry them with you." This book was delightful; I was completely hooked by it from the get-go. I also instantly fell in love with Celeste Ng's writing, which flows so beautifully and got me immersed right away. It's actually quite difficult for me to summarize this book shortly because the story is complex and has several storyline layered on top of one another—in a good way of course. This book started off with a house on fire; and then the story tracks back to the past and tells everything leading up to the fire. 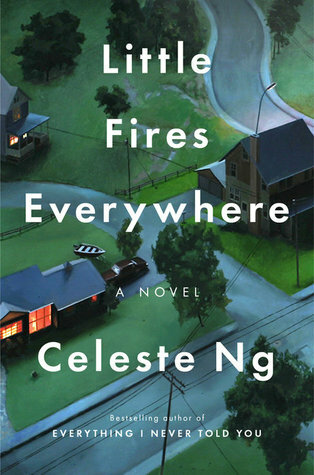 At first I was unsure where the story is going with several plot happening simultaneously, but Celeste Ng was able to bring everything together nicely at the end. There are just too many moments while reading this book when I quietly said to myself, 'This is too good!'. "It came, over and over, down to this: What made someone a mother? Was it biology alone, or was it love?" 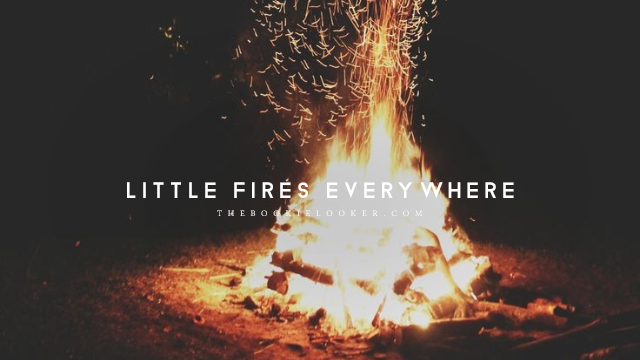 I won't discuss about the plot in too much detail, but I will share some of the things that I really liked from Little Fires Everywhere. The first one is undoubtedly the dilemma that the story gives me as I'm reading this book; it's remarkably thought-provoking. If you've read the summary, you'll know that the main plot is about a child custody battle between the child's biological mother and a couple who wants to adopt the child. I won't go into the details to avoid spoiling too much, but I was completely torn with the situation. On one side, I think the biological mother should have the right to raise her own child. However, Celeste Ng tells us the background story of this couple who desperately longed for a child—thus the appearance of this Asian-American baby was like a miracle to them. I was totally immersed in the story to the point that I asked my family about their opinion on this matter 😂😂. I know, I'm taking a fictional story too seriously; and that shows just how invested I am in the plot and characters involved in this book. "It bothers you, doesn’t it?" Mia said suddenly. "I think you can’t imagine. Why anyone would choose a different life from the one you’ve got. Why anyone might want something other than a big house with a big lawn, a fancy car, a job in an office. Why anyone would choose anything different than what you’d choose." "I don't have a plan, I'm afraid, but then, no one really does, no matter what they say." The second thing that I love the most about Little Fires Everywhere is the characters and how Celeste Ng makes them feels so real because of the depth she gives to each one. Throughout the book, mysteries and histories are slowly revealed about the characters. Those background stories makes all of them relatable in their own way. It makes me understand why they do the things that they do—whether it's right or wrong—and I absolutely love that about this book! Like I said, the characterization has a great depth which makes them not just a good character or a bad character, but it makes them seems like real human beings. It's really interesting as well to see the dynamics between all these characters; because some of them are really different from each other. "The firemen said there were little fires everywhere," Lexie said. "Multiple points of origin. Possible use of accelerant. Not an accident." To be honest, I wasn't completely satisfied by how the book ended; I wanted more, I needed more. Even so, it doesn't lessen my love for this book. I still remember clearly how each day I always looked forward to a free time when I was able to pick this book up. I know some people didn't agree this book won the Goodreads Choice Awards 2017 for Fiction, but I personally think Little Fires Everywhere is amazing. A book that's very engrossing, successfully engaged me emotionally, and made me deeply invested in the characters definitely deserves a 5-star in my dictionary. After reading this book, I'm quite excited to read Celeste Ng's previous book: Everything I Never Told You because I'm addicted to her writing style. I think from this point onwards, Celeste Ng is one of my auto-buy authors 💕💕.